As the 2013 draft approached there were two college players that were often talked about at the top of the draft. Mark Appel was entering the draft for the second time after choosing not to sign with the Pittsburgh Pirates during the 2012 signing period and Kris Bryant was considered to be the power bat of the draft. While those two received much of the hype, Billy McKinney a left-handed outfielder from Plano West High School was receiving many accolades of his own. Many scouts and analysts considered McKinney one of the best pure hitters in the entire draft. A pure hitter isn’t just a hitter with one hitter trait that sticks out, a pure hitter has the ability to do it all with the bat. These types of players consistently have a high batting average, they don’t strike out often and can work the count. They also have the ability to hit the ball hard on a day-to-day basis. McKinney displayed these characteristics at a young age. As a freshman at Plano West High School in Plano, Texas he hit .414 with a .527 OBP driving in 41 runs and launching seven baseballs over the outfield walls. McKinney just kept hitting all through high school. During his four-year high school career he finished with a .416 batting average and got on base at a .568 clip. While he committed to playing baseball and furthering his education at Texas Christian University the outfielder got a unique opportunity as the 2013 draft approached. Major League Baseball invited McKinney to attend the live portion of the draft along with a handful of other players. 2009 was the first year MLB started to invite players to the live portion of the draft. The first player to ever attend was now a superstar and league MVP, Mike Trout. In the first round of the draft McKinney heard his name called as the Oakland A’s selected him with the 23rd overall pick. McKinney himself had the honor of placing his name on the draft board and also got to put on the Oakland A’s uniform for the very first time. McKinney opted to bypass TCU and sign with the Oakland A’s a short time after the draft. At just 18 years old, McKinney was assigned to the Arizona Athletics in the Arizona Rookie League. In his first taste of professional baseball McKinney hit .320 and continued to show off his pure hitting abilities. After appearing in 46 games the Athletics promoted McKinney to the Vermont Lake Monsters to finish the season. In his short stint in Vermont, McKinney went 12 for 34 for a .353 batting average and finished the season with an overall OBP of .387. As the 2014 season began the Oakland A’s aggressively pushed McKinney and assigned him to the Stockton Ports, their California League affiliate. At just 19 years old, the outfielder was almost four years younger than the average player in the league. Matched up against more experienced pitchers, McKinney struggled to keep his average to the lofty levels he had in high school and his first year as a professional. While he did hit a career high 10 home runs in the hitter friendly California League, McKinney only hit .241 in his 290 at bats with Stockton. On July 5th, 2014 the Oakland Athletics dealt McKinney to the Cubs along with Addison Russell and Dan Straily in a blockbuster trade. The A’s received pitchers Jeff Samardzija and Jason Hammel in return to bolster their starting rotation for a playoff run while the Cubs acquired some highly valued talent to upgrade their already impressive minor league organization. A few days after being acquired by the Cubs, McKinney would make his Cub debut with Daytona in the Florida State League. Playing a combination of right field and center, McKinney adjusted quickly to the heat and humidity of Florida. In his 51 games with the Cubs, McKinney once again raised his batting average over the .300 mark to .301. He also saw his OPB increase back up to .390 and his OPS top the .800 mark at .822. 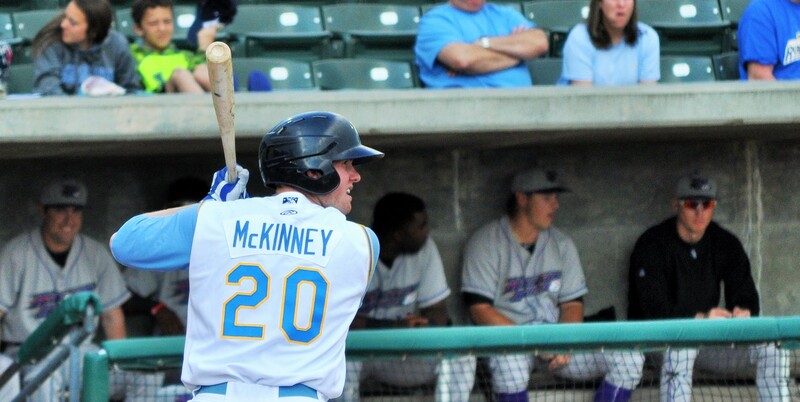 The Cubs opted to keep McKinney at the Advanced A level to start the 2015 campaign. The Cubs moved their affiliate from the Florida State League to Myrtle Beach in the Carolina League for the 2015 season and beyond. As a member of the Pelicans, McKinney has seen time at both corner outfield positions as well as an occasional start as the teams designated hitter. In his first 21 games with the Pelicans, McKinney has put up similar numbers to his 2014 time in Daytona. The left-handed hitter is currently hitting .299 with a OPB/OPS line of .389/856 showing a consistent approach at the plate. McKinney has shown good strike zone management walking 10 times while only striking out 11 times to this point in the season. With continued success, McKinney’s time at the beach could be short as the next step for McKinney would be to challenge him at the AA level in Tennessee. 1. You had the opportunity to attend the 2013 draft. Take us back to that day and tell us what your experience was like. Ever since I was a kid all I ever wanted to be was a professional baseball player. When I got the call and was asked I wanted to attend the draft I immediately said yes. I had always dreamed of getting my name called and shaking Bud Seligs hand. I was glad that I was able to experience it and got to hear my name called on draft day. 2. You started your professional career in 2013 and made your way through two levels of baseball. What did you find that was the biggest between amateur baseball and the professional game? The game speeds up. The game sped up on me really quick going from high school to pro-baseball. You have to be able to adjust to it and fast while still trying to play your game. 3. You started your 2014 season in Stockton and then midway through the season you were dealt to the Cubs in a blockbuster trade. How surprised where you that you got traded and how did you hear the news? I was extremely surprised and extremely excited as well. I didn’t really expect it at all, I got scratched from the game that day just a few minutes before the game. I was extremely excited that Addison (Russell) and Dan Straily came along with me, those were two of my favorite guys when I was with Oakland. Later in the game, around the seventh inning my manager came up to me and told me that I had been traded to the Cubs. I moved from California that night to being across the country in Florida the next day. 4. Your about 70 games into your career in the Cubs organization. Is there any big differences between how the Cubs and the A’s approach young players like yourself as you develop your game in the minor leagues? I think both organizations are great and they both go about their business in a professional way. There aren’t too many big differences between both organizations right now. I would say there just is a large amount of hype about the Cubs right now with Kris Bryant and Addison coming up to the big club and I look forward to watching and seeing their success in the big leagues. 5. Is there a coach or instructor in either system that has helped you develop and get you to the point that your are at in your career? I would say there have been great coaches everywhere. There are some great coaches here in Myrtle Beach and I love all of them. There are also some great coaches in the Oakland organization that I really admire. I really try to take everything in they say and talk to me about. They are ex-ballplayers as well and they have so much knowledge that they can share with not only me but my teammates. 6. In your career you have shown some pop in your bat but also the ability to consistently get on base. What is your approach at the plate? My approach really depends on the scenario I am in whether it’s guys on base, the count i’m in, or how many outs there are. I try to do whatever I can to help my team win. If that means giving myself up i’ll do so. I just want to help the team get runs on the board and ultimately I want us to get the W at the end of the night. 7. Whats the biggest part of your game that you feel you need to work on to advance from Myrtle Beach to Tennessee? I think I really need to get better in ever aspect of my game. I honestly think that I just need to keep getting better not just to get to Tennessee but to get to the big leagues. That is the place I ultimately want to be, so in order to do that I need to work on my hitting, my defense, base running and keep building up my knowledge of the game. Josh Hamilton – Just because of everything he went through, being an addict and getting through all the tough times. He came back from that and ended up being a darn good baseball player. His story is a great story and I know he is having a tough time now but I hope he gets back on the field and finishes his career strong. 2. What is your 2015 walk up song? 3. 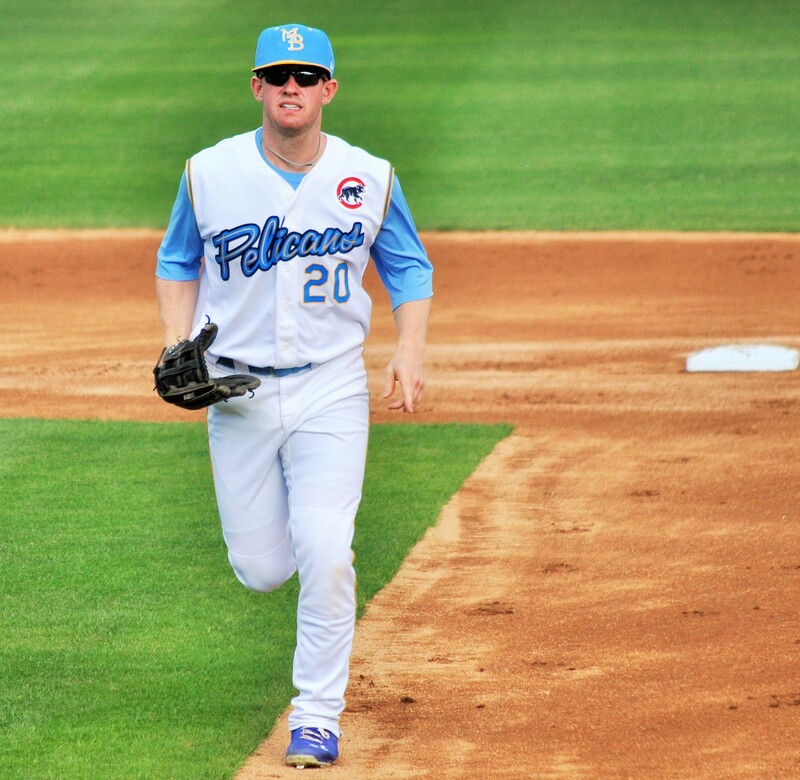 It’s early in the season but who might be the biggest prankster on the Myrtle Beach Pelicans roster? Everyone pranks everyone and has a lot of fun here in the clubhouse, but if I have to name one guy i’d go with Ben Carhart. 4. You mentioned that you and Addison Russell are good friends. When you heard the news what did you think and did you get a chance to talk to him afterwards? I was ecstatic once I heard the news. We got on the bus and I was checking my twitter feed and I saw the news. I immediately texted him and also some of his family as well. I was extremely pumped for him and I hope for nothing but the best for him. I have nothing but confidence that he will be successful at the major league level.